There’s a delightful country lane which follows a babbling brook to our local riverside church, 200 yards away. Few cars use the lane, and it’s on level ground, so it is good for wheelchairs. 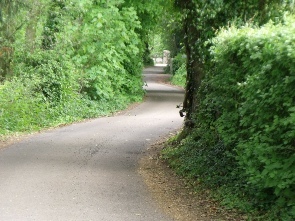 The lane is shady and peaceful all through the summer, with plenty of hedgerow birds. Listen out for the woodpecker, and sometimes you’ll find the kingfisher on its hidden perch among the leaves over the stream. You just might catch a glimpse of a fritillary butterfly - or the rare violets that feed their caterpillars. Watch out for the stoats and stags crossing the lane and otters hunting under the footbridge, even in daylight. Look carefully and you might be lucky enough to see rare water-voles rustling through the grass on the banks, or resting on the stones just out of the water. There’s a large colony of slow-worms, and they can be seen sunning themselves, perhaps a dozen knotted together, on the wall. The magnificent trees were planted when the rectory and parish school was extended by the wealthy swiss-born Reverend Daniel Renaud in 1727, and given its attractive regency character. He diverted the stream and drive from the south side of the rectory to their present courses along the north side. The stream once had a very different course: The bend outside the entrance to the lane, where the main road forded the stream in those days, is known as “Stopgates”, because sluicegates there once maintained water levels in the garden of the Old Court. From the ford the stream used to flow down Old Wharf Lane to Old Wharf, which was filled in by boatmen after the Second World War. The former rectory is now a residential care home and renamed Whitchurch House, but in the 1920s it was the first place in the village to have electricity, and the remains of electric lamps can still be seen in the trees of the lane. If you are staying in Symonds Yat, the Country Promenade is accessible in the evening from the B4164, In the quiet of the late evening you’ll see dozens of bats, and hedgehogs snuffling about at the edges of the lane - both looking for their favourite insects, which are attracted here by the humidity around the brook.